Brief：The formation of China-New Zealand comprehensive strategic partnership has "ushered our two countries into a new cooperative era," Chinese President Xi Jinping told a forum today.Xi and Key met with representatives of Chinese enterprises in New Zealand as well as members of the "New Zealand China Council", a New Zealand government organization established in 2012 for promotion of trade and other links with China. Chinese President Xi Jinping and New Zealand Prime Minister John Key attend the launching ceremony of China-New Zealand Mayor Forum in Auckland, New Zealand, Nov. 21, 2014. 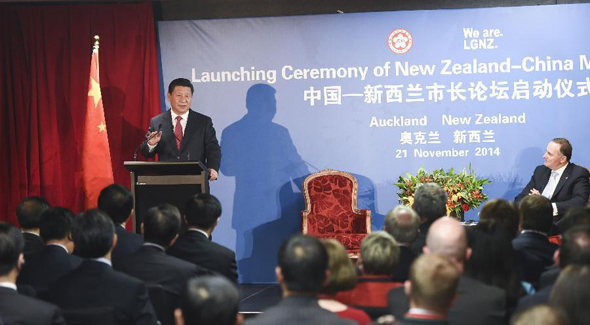 The formation of China-New Zealand comprehensive strategic partnership has "ushered our two countries into a new cooperative era," Chinese President Xi Jinping told a forum Auckland Friday. Xi and New Zealand Prime Minister John Key attended the launching ceremony of China-New Zealand Mayor Forum, a sideline event of Xi's state visit to the island country. Xi told mayors from the two countries that the Chinese and New Zealand economies are "highly complementary" and the two peoples "bear friendly affections toward each other." He compared the China-New Zealand relationship to an oil painting. "How spectacular such an oil painting can be depends not only on the overall structure but also on its detailed elements." The 30-plus pairs of friendly cities from the two countries, he added, constitute "the detailed elements" of the grand landscape. China has been making efforts to speed up industrialization, informationization, urbanization and agricultural modernization. "Such endeavors provide more opportunities for New Zealand and greater space for bilateral cooperation," he said. The president urged localities of the two countries to seize the opportunities and enhance cooperation in an effort to "paint a new picture of China-New Zealand friendship." For his part, Key said Xi's visit to New Zealand has facilitated the upgrading of bilateral ties to a comprehensive strategic partnership, and has filled the two sides with full expectations for the future. He hoped the two countries can expand local cooperation and promote people-to-people exchanges for further growth of bilateral ties. Xi and Key also met with representatives of Chinese enterprises in New Zealand as well as members of the "New Zealand China Council", a New Zealand government organization established in 2012 for promotion of trade and other links with China. Xi is on a three-day state visit to New Zealand, the first by a Chinese president in 11 years. He is scheduled to fly to Fiji later Friday to continue his South Pacific trip, which has already taken him to Australia.